Additional story contributions by Matt Knicl and Allison Medwin. 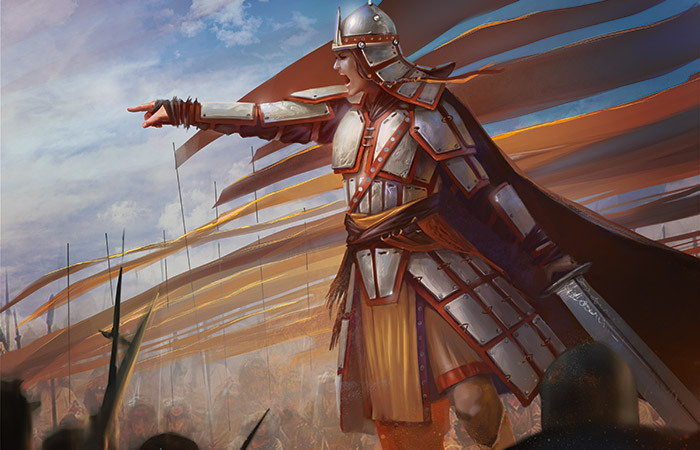 The young khan of the Mardu sat poised at the front of her horde, perfectly still despite her horse shifting nervously beneath her. The worn leather grip of her bow, the weight of her sword on her back, the nervous energy of the warriors almost palpable behind her—she drew strength from all of these. More than anything else, she drew strength from her war name, Alesha, because it was hers. She scanned the bluffs above her, but couldn't see the warriors she knew were crouching there. She peered ahead, toward the mouth of the canyon, searching for a sign of their foe. She saw five—no, six—dark shapes in the air. They were too far away to make out the details—their four feathered wings, sinuous bodies, and long fins and spines—but a crackling of lightning around and among them left no doubt in her mind. These were the dragons they sought, the filthy brood of the monstrous Kolaghan. "Mardu!" The answering shouts from the horde shook the canyon, and Alesha smiled. The dragons couldn't miss them now. The distant shapes grew larger as the dragons sped toward the horde. Horses snorted as riders shifted in their saddles, readying themselves for the charge. Goblins chittered in their eagerness to die, and orcs stood like stone, waiting. Silently, Alesha raised her bow over her head, signaling the archers to ready their arrows. She waited, taking in a long, slow breath as the dragons winged ever closer. The air thrummed with the beats of their wings, and the tang of lightning blew to her on the wind. She lowered her bow, fitted an arrow, and drew back, hearing the creak of a hundred bows behind her. She could see the cold glow of the beasts' eyes and the lightning crackling in their mouths. Her arrow struck the first one in the mouth, sending a stray bolt of lightning harmlessly to the ground. A hundred arrows followed it, and the dragon veered up and to the side. Right into place. A half-dozen warriors dropped from the bluff onto the swerving dragon. One hit a wing and slid off, falling to his death. Two more clung desperately to spines on its back as it wheeled around in surprise. One clutched the dragon's long tail. But two Mardu—two who would be celebrated this night—drove swords into its flesh, striking deep into its shoulder and its flank. The beast roared its pain, and lightning sent a cascade of rock tumbling down the canyon wall. Alesha nudged her horse and loosed another arrow as she charged forward to meet the other ones head-on. Hooves thundered behind her, goblins shrieked, orcs rumbled their war cries. The Mardu surged to greet death, swords in hand. 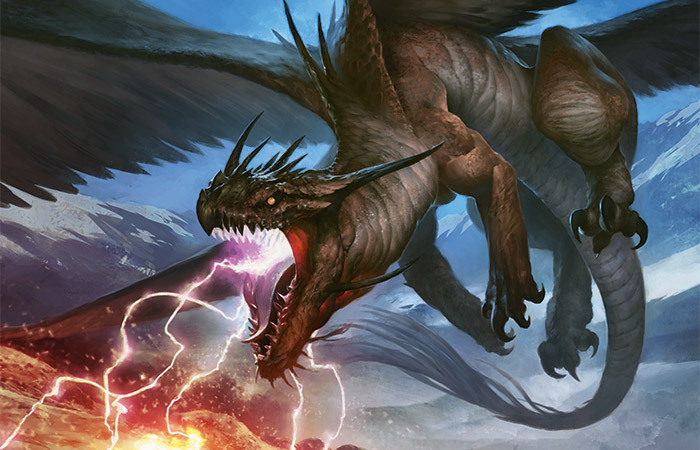 A dragon swooped down, opening its mouth to strafe Alesha and her vanguard with its deadly lightning breath. Her arrow lodged in its mouth, but an instant later lightning was flashing all around her. Panic surged in her chest, a memory of past terror, when another spawn of Kolaghan's brood had given her the scars she wore on her back. Her horse reared and whinnied, and Alesha jumped from the saddle before the beast could throw her. She rolled on the ground and came up in a crouch. The brazen shouts of the Mardu horde were mingled now with howls of pain and warning cries as the battle began in earnest. Alesha nocked another arrow and surveyed the field. With a handful of arrows jutting from between its scales, the dragon that had blasted her vanguard was circling around for another run. "That one!" she shouted, gesturing with her bow. "Bring it down!" From the smallest goblin to the tallest orc, every warrior in earshot turned as one, ready to carry out her will. A flurry of arrows battered the beast, bouncing off its scales or lodging between them, piercing holes in its wings, or—one very skilled or lucky shot—lodging in an eye. The creature shrieked, a deafening noise that sent goblins diving for cover and made even seasoned veterans duck their heads and shuffle a few steps backward. It landed, claws first, crushing and tearing at everything in reach. Alesha loosed one more arrow, which lodged in the beast's shoulder, then drew her sword from her back. "On it!" she shouted. "Now!" She could see the dragon collecting itself, getting its feet beneath it so it could launch itself into the air again. They had to kill it before it could do that. As one, her band surged ahead and crashed on it like a wave, with Alesha in their midst. Their numbers were pitifully small, she realized. The crash had killed many, and five other dragons kept the rest of the horde occupied. Six of the beasts were enough to guarantee a moment of glory for every fighter who deserved one. Her heavy blade—as long and as wide as her arm—bit deep into the dragon's flank, and she ducked as its wing lashed out in response to the pain. It tried to wheel around and face her, but a mighty swing from a towering orc's blade knocked its head back and sent a spray of sharp-smelling blood in its wake. Alesha nodded, watching the orc, a soft heel who had yet to earn his war name, despite fighting in many battles. This was his moment, and she wanted to witness it. A true warrior would have leaped into the opening his mighty blow had created, driving his sword into the creature's neck. An orc as strong as this one might even have been able to sever the head with a well-placed strike. There was the briefest pause as the others watched, anticipating the moment of glory. It didn't come. Instead of going for the kill, the orc turned and slashed at the dragon's foreclaw, an instant before it would have cut across another fighter's belly. It was Gedruk Wingbreaker who ran forward and hacked at the creature's neck before it could regain its balance. It took him three hacking blows as the dragon writhed and flailed, and the beast's foul blood coated him before it was done. But at last it lay still, and a cheer went up from the fighters that circled it. Alesha scanned the field of battle. 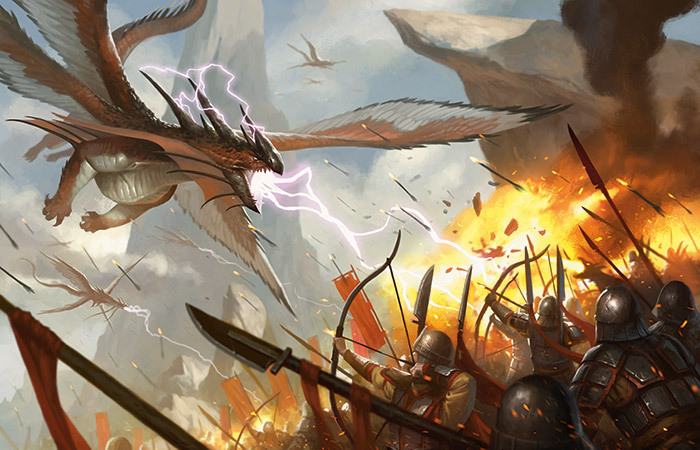 One other dragon was dead—the one that had led the initial charge—and two more were grounded. She pointed at one in the air, wheeling around for another strafing run. "That one!" 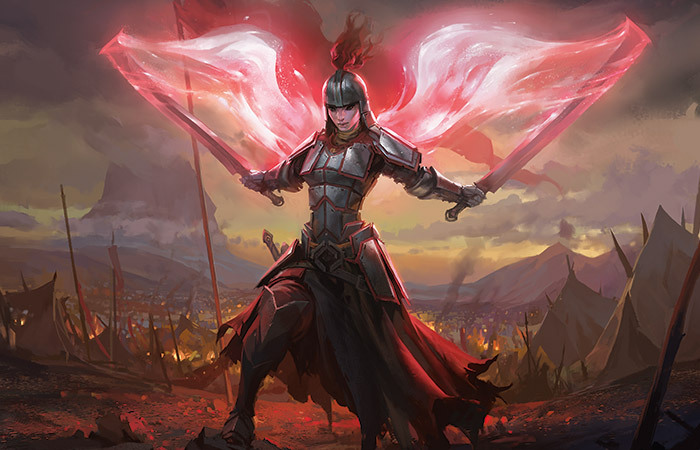 she called, and the Mardu braced themselves to bring it down. While it maneuvered, though, they would have a moment to savor their triumph. "You!" she barked at the orc. He stepped closer, towering over her. "Khan?" he said, his voice a rumble almost drowned out in the noise of battle. "That kill could have been yours." She watched him carefully as her words sank in. He bristled, drawing himself up even taller. "Gedruk stole it." "You could have earned your war name," she said. "Know who you are, and claim it." They all knew what to do. Another hail of arrows sought out the beast's softer spots, this time joined by a blast of fire from a spark cannon. This one, too, crashed to the ground, and this time most of the warriors were out of reach of its flailing claws as it landed. 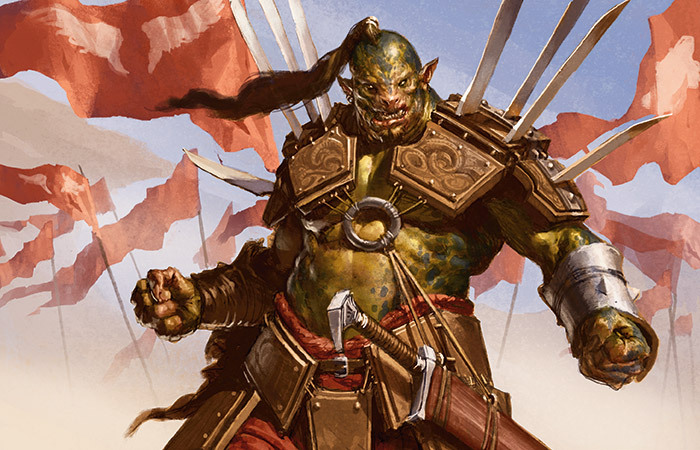 Alesha shouted and the Mardu—even the nameless orc who had challenged her—rushed forward to meet it. 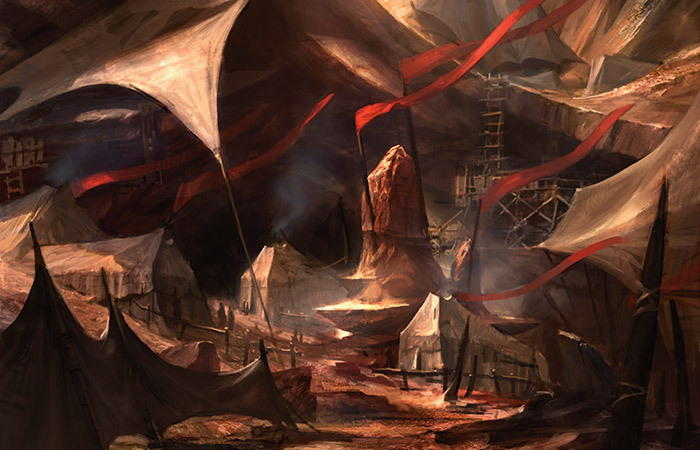 Half-lost in her memories, the khan of the Mardu was smiling when the other dragon hit the ground behind her, smiling as she whirled to face it, smiling as her sword bit deep into its neck while it lunged at the nameless orc beside her. It bellowed and thrashed as death came to claim it, but one more swing of her heavy blade cut its head clean off. The orc beside her stared dumbly, no trace of anger remaining on his face. "I know who I am," Alesha said to him, still smiling. "Now show me who you are." She nodded toward the last two beasts that still snapped and snarled at the surrounding Mardu. He hesitated, still slack-jawed, but then collected himself and ran back into battle. She followed him, watching as he threw himself into the frenzied melee around the largest of the dragons. He was strong, clearly, and fast despite his bulk. He fought with no lack of skill, but his techniques were unorthodox. He used his strength to batter the beast's head and limbs, to knock it off balance and shift its position. He ensured that its deadly teeth and claws never made contact with the other fighters, and he made openings for his allies to strike. He wasn't looking for the killing blow, but he made it possible. Alesha nodded, smiling to herself. Soon enough, the battle was over. Six dragons lay dead on the canyon floor among many dead warriors. Their losses were steep, but six dragons! Six of Kolaghan's brood would never prey on the Mardu again. The horde had much to celebrate. The survivors set to work. The woe-reapers chanted their ancient rites over the dead to keep them still in death. Goblins skittered over the battlefield, gathering arrows that could be reused and broken weapons that could be reforged. Other Mardu carved up the dragon corpses for meat and trophies. Alesha walked among them, just as she had fought beside them. In each cluster of fighters, she sought out those who had not yet claimed a war name. On this day, many had earned the right to claim their names. She listened to tale after tale of heroic deeds, and with each name chosen, she shouted the name for the horde to hear—with never a moment's hesitation. Fangbreaker. Cliffleaper. Barzeel. Tailrider. Turuk. Vallash. At last she came to the orc who had fought beside her, the orc who had dared to question her. "You," she said. "How many battles have you fought?" He stood stiffly, looking over her head rather than meeting her gaze. "Nine." "And what deeds of glory do you claim this day?" "None? Nine battles and you have earned no glory? You have no war name to claim?" "Then you are a fool. I know who you are, but you don't know yourself." He bristled again, but this time didn't dare to speak. She turned to the warrior next to him. "Kuru Vashar," she said, "you fought beside this soft heel today. What did you see?" Vashar stood and looked at the taller orc. "I fell underneath one of the dragons," she said. "Its weight crushed me to the ground. You stood beside me and struck the beast, shifting its balance so I could get out, then you helped me to my feet." Alesha nodded and pointed to another. "Magran Backbreaker, what did you see?" "Khan, this one put himself between me and a deadly claw. His strength knocked the claw aside, then I slipped past and drove my spear beneath the dragon's foreleg." One more. "Jalasha Impaler, what did you see?" Jalasha reached up and clapped the orc on the shoulder. "My friend saved my life, throwing himself onto a dragon's head when it was about to take me in its jaws." Alesha nodded and stepped close to the nameless orc. She grabbed the edge of his armored collar and pulled his head down, forcing his eyes to meet hers. "I know who I am. I am not a boy. I am Alesha, like my grandmother before me." Several of the nearest warriors murmured their approval. "And I know who you are," she said. "The Mardu know you. But you—you think every Mardu must be a Backbreaker or Helmsmasher. You think your deeds are not as glorious as theirs. And you are wrong." She let go of his armor and shoved him, sending him stumbling back a few steps. "When you learn what your place among the Mardu is, then you can choose a name." She turned away, ready to move to the next group of soldiers. Alesha paused but did not turn around. "Why?" "I have a tale of the battle." She turned and glared at him. "We have heard enough of your deeds." "This is not my glory." He raised his voice so all around could hear. "Today I saw a warrior strike down a dragon with a single blow, and on her face she wore the joy of battle." The orc took a step closer and spoke more quietly. "As you say, my khan, I do not know myself. But I know you, I follow you—"
Now he shouted over all the din of the battlefield. "—and I call you Alesha, Who Smiles at Death." And once again, the warriors of the Mardu shouted her name.